This antibody does not cross react with PHAP12a or PHAPIII isoforms. Apoptosis is related to many diseases and development. Caspase-9 plays a central role in cell death induced by a variety of apoptosis activators. Cytochrome c, after released from mitochondria, binds to Apaf-1, which forms an apoptosome that in turn binds to and activate procaspase-9. Activated caspase-9 cleaves and activates the effector caspases (caspase-3, -6 and –7), which are responsible for the proteolytic cleavage of many key proteins in apoptosis. The tumor suppressor putative HLA-DR-associated proteins (PHAPs) were recently identified as important regulators of mitochondrion apoptosis. PHAP appears to facilitate apoptosome-mediated caspase-9 activation and to stimulate the mitochondrial apoptotic pathway. PHAP was also shown to oppose both Ras- and Myc-mediated cell transformation. Our Abpromise guarantee covers the use of ab5991 in the following tested applications. WB Use a concentration of 0.5 - 2 µg/ml. Detects a band of approximately 32 kDa.Can be blocked with PHAP1 peptide (ab6240). 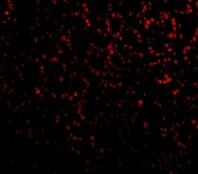 Immunofluorescence of PHAP I in Mouse Small Intestine cells using ab5991 at 20 ug/ml. Publishing research using ab5991? Please let us know so that we can cite the reference in this datasheet. Is the immunogen sequence available? The synthetic peptide corresponds to amino acids at carboxy terminus of human PHAP I. Unfortunately, the sequence is not available.